We’re big fans of salmon or as I call it for Madeline “pink fish.” She gobbled this up and even asked to take it for school the next day. I wonder what all her classmates thought! I have to rave about my favorite place to buy wild caught salmon – Wild for Salmon. It’s a local couple who goes sockeye salmon fishing every year in Alaska. They sell at our local farmers market several times a year and I always make sure to stock up. Their smoked salmon spread is to die for! I also love their feta-dill salmon burgers. They’re perfect for a quick meal on busy weeknights! So back to the recipe. I bought a 2 lb filet from Steve at the last market and used half of it for this recipe and then just baked the other half. I loved the combination of mustard and panko! Preheat oven to 425 degrees. In a small bowl, mix together the panko, parsley, lemon zest, 1/2 teaspoon salt and 1/2 teaspoon of pepper. Drizzle with olive oil and stir until the crumbs are evenly coated. Set aside. Place the salmon fillets skin side down. Generously brush the top of the fillets with mustard and then season generously with salt and pepper. Press the panko mixture thickly on top. Heat the vegetable oil over medium heat in an oven safe pan. Once the oil is hot, add the salmon fillets, skin side down and sear for 3 to 4 minutes to brown the skin. Take care not to move or turn over the fillets. 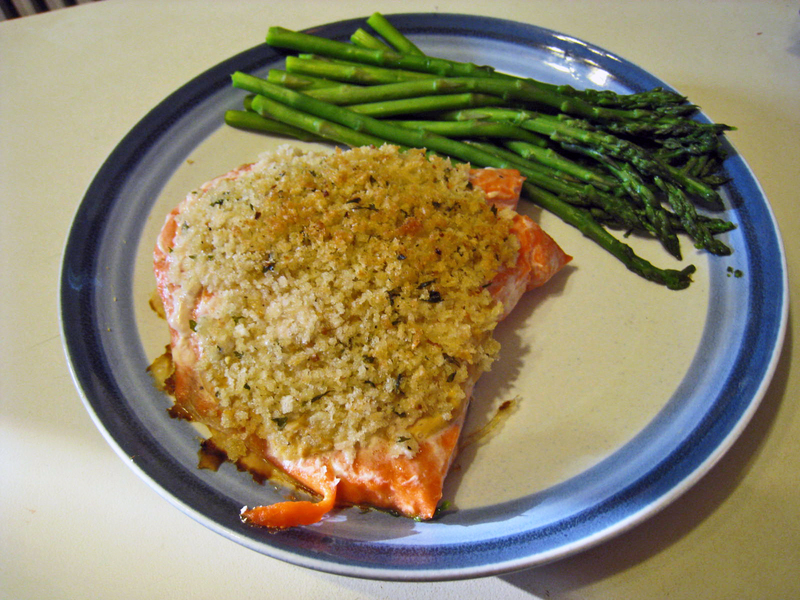 Transfer the pan to the hot oven for 5 to 7 minutes or until the salmon is almost cooked through and the panko is browned. Remove from the oven and cover with aluminum foil. Allow the fillets to rest for 5 to 10 minutes.